PRIMARY STRENGTHS: The offense should be a juggernaut with the return of Taylor, Williams, and Evans. 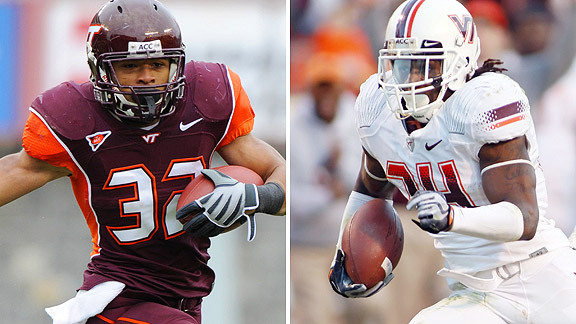 Evans' return from a knee injury that cost him 2009 gives the Hokies one of the top tailback duos in America. Taylor, who has a deep receiving corps at his disposal, improved his accuracy last year. POTENTIAL PROBLEMS: Tech's defense doesn't have much margin for error right away with an opener against Boise State. The Hokies will also go into the year with a new placekicker and punter. Depth is a concern at a few positions, including defensive tackle and safety. The offense is the far more veteran side of the football and they overcame a lot of adversity to produce the ACC’s 2nd highest scoring unit last year. 1,200 yard rusher Darren Evans missed the entire season due to a torn ACL in camp and there was serious concern that his production would not be replaced. However, sophomore Ryan Williams (1,655 yards, 21 TDs) stepped up in his absence and ran away with the ACC rushing title, earning 1 st Team Freshman All-American honors in the process. This fall, the Tech rushing game will be downright terrifying, as Evans was fully healthy in the spring and looked as good as ever. This will be one of the country’s elite tailback tandems in 2010. Senior quarterback Tyrod Taylor (2,311 pass yards, 13 pass TDs, 5 INT, 370 rush yards, 5 rush TDs) is also a major threat running the ball, though he also proved last season that he was also a solid passer. Taylor has really evolved in his three seasons at Virginia Tech and he should have his best season this fall with his top three targets from 2009 back. Juniors Jarrett Boykin (40 catches, 835 yards, 5 TDs, 2nd Team All-ACC), Danny Coale (30 catches, 614 yards, 2 TDs) and Dyrell Roberts (22 catches, 390 yards, 3 TDs) are a talented group of big play receivers and they should have an even stronger campaign in 2010. The final piece of the puzzle is the offensive line, which paved the way for the league’s 2nd best rushing game last fall. The Hokies have to replace two starters, both of whom were 2nd Team All-ACC selection, which started for a combined total of seven seasons. These are clearly huge losses but the three returning starters are all upperclassmen and the O-Line performed well during spring practice. I have confidence that this group will protect Taylor and open big holes in the running game this season. In the end, I believe that this Virginia Tech offense compares favorably to the Alabama attack from last season that carried the Crimson Tide to the National Championship. The Hokies have two of the best tailbacks in the entire country in Evans and Williams and both could eclipse the 1,000 yard barrier this season. Furthermore, Tyrod Taylor’s experience and athleticism provides an extra dimension to the rushing game as he can take a broken play and turn it into a big gain. Finally, Virginia Tech’s wideouts were actually more of a big play threat last season than the group that was led by Julio Jones in Tuscaloosa! 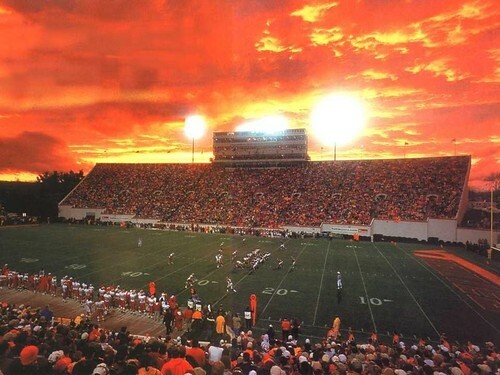 All of this leads me to believe that the Hokie offense is going to be a vicious force in the running game this season and their passing attack will gain yards in bunches off of play action. I fully expect this to be one of the country’s top running teams and the Hokies will bulldoze over a lot of opponents this fall en route to one of the ACC’s highest scoring offenses. There are considerably more question marks on the defensive side of the football, as Virginia Tech only has five returning starters from the ACC’s #1 rated scoring defense. However, this unit is still coached by Bud Foster and he is generally regarded as one of the best defensive coaches in the nation, so I have a great deal of faith in his ability to reload. The D-Line is generally a strength for the Hokies, so last year’s run defense was a disappointment as they gave up more rush yards than any year since 2003. The only starter returning from 2009 is senior defensive tackle John Graves, who is a stalwart against the run but will not make an impact in the pass rush. Sophomore Antoine Hopkins will pair next to him and I think that this will be a solid duo against the run. Where this line will suffer is in the pass rush, as departed ends Nikos Brown and Jason Worilds combined for eleven sacks last fall. Junior Chris Drager (22 tackles, 2.5 sacks) seems likely to start in one of their spots but I don’t expect to see the front four get after the quarterback with a lot of consistency this year. I am much more confident in the linebackers. Junior Barquell Rivers is the team’s top returning tackler after making 96 stops last fall and he should continue to be a force against the run. Meanwhile, sophomore Lyndell Gibson (53 tackles) was impressive in five starts and should be a tackling force this fall. Much like the D-Line, this looks like a strong group against the run but I don’t see this group pressuring the quarterback frequently. The secondary is also full of athletes. Senior corner Rashad Carmichael (55 tackles, 6 INT) is one of the league’s best shutdown defenders and he should cut the field in half for the pass defense. On top of that, there should be a solid pair of safeties this season as senior Davon Morgan (47 tackles) will pair with redshirt freshman Antoine Exum, who was very impressive in the spring. While there will probably be two underclassmen starting for this unit, I have a lot of confidence that Carmichael will provide great leadership and guide this group to a strong 2010 campaign. In the end, I have a lot of faith in this defense. Even with all of the replacements, the front seven looks to be quite solid against the run this fall. My only concern is the lack of any proven pass rushers, which could undermine a solid group of defensive backs. That said, Head Coach Frank Beamer and DC Foster have built up a lot of cache from their consistent reloading on defense in the last decade and I’m going to give them the benefit of the doubt when it comes to getting pressure on the quarterback. I think that this will be a typically tough Virginia Tech defense, especially on the ground, and they should continue their presence near the top of the conference in scoring defense. Nice job CA, let me tell you, don't sleep on MLB Barquell Rivers. I recorded over 100 tackles with him in year 1 of C2C over at Tradition! Evans and Williams are a great tandem and TT is pretty solid. The WR core is tall and fast. You will do real well with them. Nice job with the preview. He is one mean, fast, tackling mutha! Sean Spence for Miami is pretty BA too. Awesome job with the preview...I always like seeing active owners contributing to the league! !